So in the first part of this trip I wrote about getting to Pom Pom, our experience there, the food, the resort and so on. But obviously we went there for diving! So how was SCUBA diving at Pom Pom island? 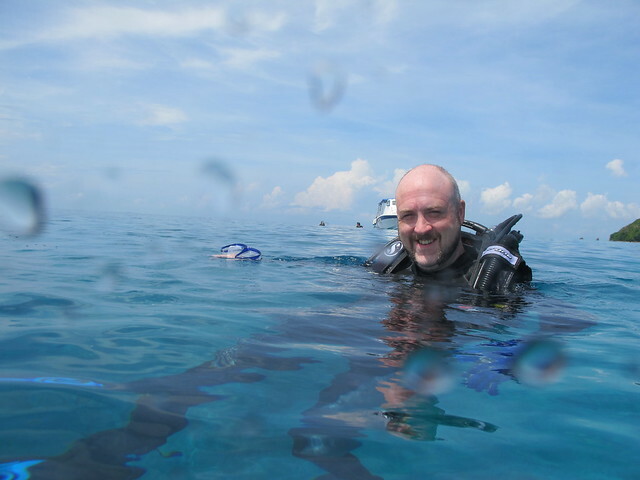 I didn’t have the best start, gearing up for the first dive..my BCD back plate snapped – boo! Shortly after this picture I think. 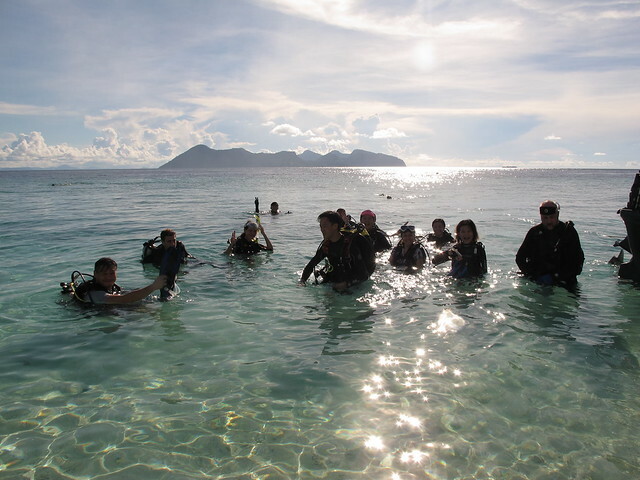 But even the shore dive on the first day was great, just look at that scenery and crystal clear water. 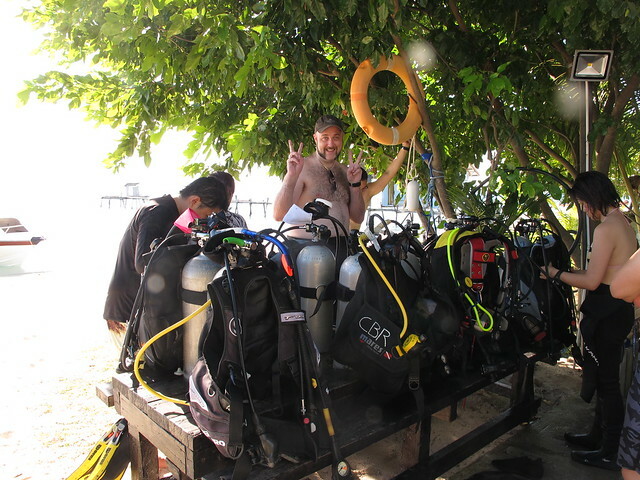 Anyway as for diving, we had a great time, visibility was pretty good on the whole, currents not to strong and some interesting spots (You’ll see so many turtles you’ll get kinda bored of it haha). The only thing that kind of freaked us out was the bombing, the sea gypsies use dynamic/grenades/c4 to bomb large areas of the coral and catch all the fish. This leads to massive devastation of the coral ecosystem, and a loud bang under the water when you are diving (if you are near enough you can feel a slight movement in the water as the force wave passes by). The place was absolutely stunning of course, whichever way you looked it was just amazing and the water was super flat like a millpond most of the time. Really relaxing. There was a good variety of things if you are into photography too (macro and micro), like this cute Juvenile Spiny Puffer. And this fearsome Moray Eel. 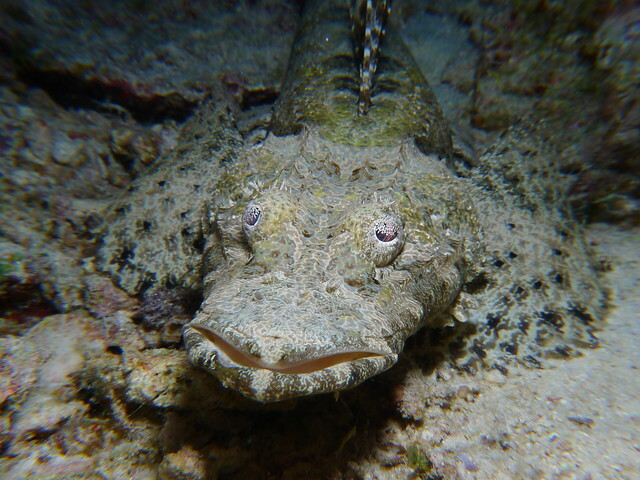 And best of all this rather prehistoric looking Crocodile Fish. 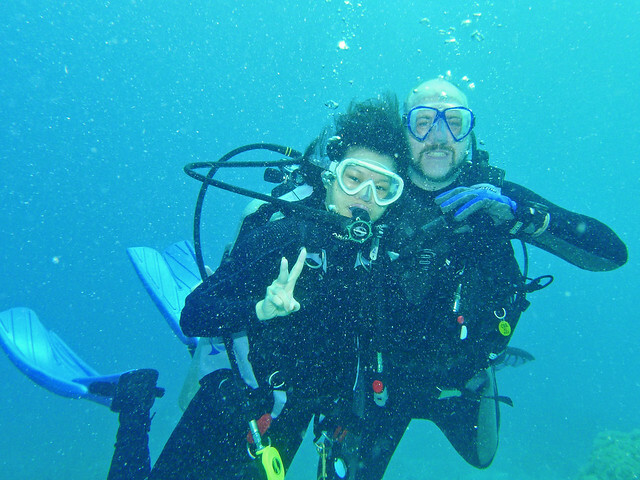 Here’s Kim and I enjoying to the max, we had a really good time and great dives at Pom Pom – can’t wait to go back! 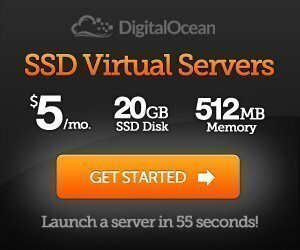 #1 Two Brothers – Beautiful coral landscape, drift dive. Orang utan crab. Turtle. Cuttlefish. #2 House Reef – amazing under the jetty was like the world’s best aquarium. Saw the massive resident barracuda called charlie. Scorpion fish, garden eels. Unicorn fish. 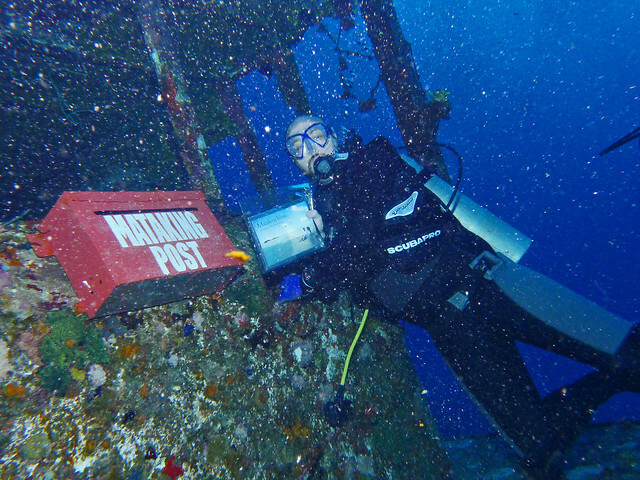 Shipwreck post is actually a pretty interesting dive as there’s an official (POS Malaysia sanctioned) underwater post box where you can send your postcards out, really cool! Unfortunately there were a LOT of particles in the water and it was pretty dark so the pictures didn’t come out great, but it was a really fun experience. 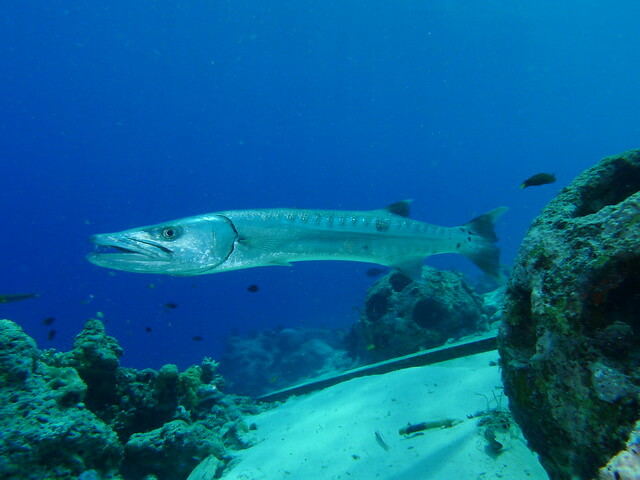 Another memorable dive was the Mataking House Reef, which is basically a dive under and around the resort jetty, there is a lone Barracuda that’s always there, IIRC his name was Charley. He kept his beady eyes on us, but was pretty cool. 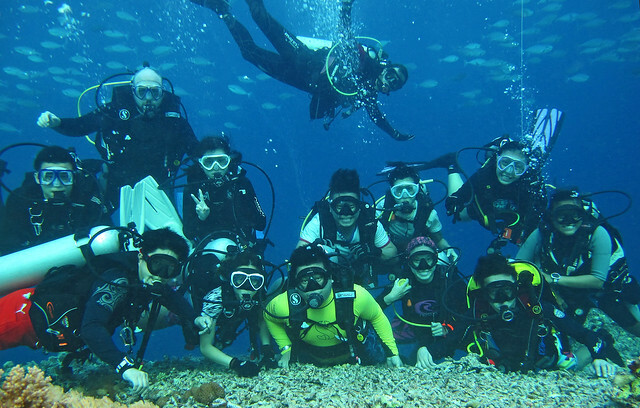 The obligatory underwater group shot (which you might have seen printed out at this years MIDE). I honestly can’t wait to go back, and am just itching to go diving in general. Arghhh! Underwater pics thanks to Marcus & JK. My gosh you only posted this after one year!!!! You all took so many pictures leh, lazy to look through hahaha. 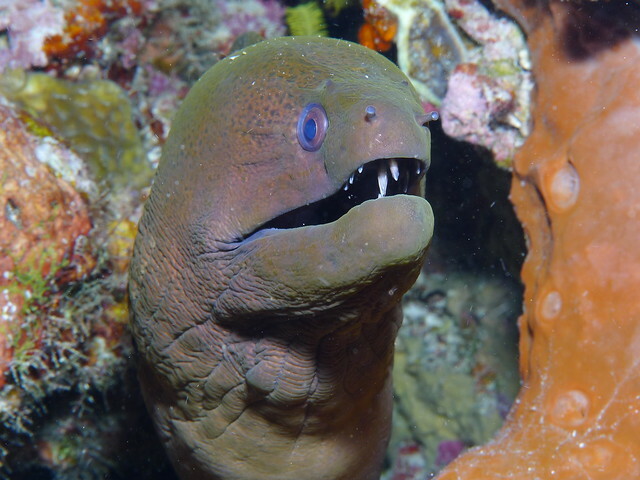 I can’t stop looking at the photo of the moray eel – it looks 1/3 cute, 1/3 adorably dumb, 1/3 fearsome. I don’t know how to feel. Haha. Yeah, I know what you mean by the explosive fishing – I’ve seen them do it, was on a deep sea fishing charter for 3D/2N and we’re all line fishing (with a rod) and someone rigged up a Jacob’s biscuit tin (you know, those big family packs) and put random stuff inside – sulfur, flash powder from firecrackers/fireworks, stones (for weight) etc and packed it full before putting a long Visco fuse and dropping it into the sea. It caused quite a massive bang and even though (as I understand it) there was no shrapnel, it works just from the shock wave killing/stunning fish. Everyone else who was fishing with the rods didn’t have a good time, needless to say since all the fish floated up (except the ones at the bottom) and the ones that didn’t were spooked away. Haha yah, same when you are in the water, kinda cute..kinda scary. Especially if you search Google Images for Moray Eel bites.. The bomb fishing really was scaring, and it’s just so destructive, we saw whole (large) areas of coral turned into grey dust by the bombing. Yah it works from the shockwave, but the same shockwave crumbles the corals. Pretty messed up stuff. 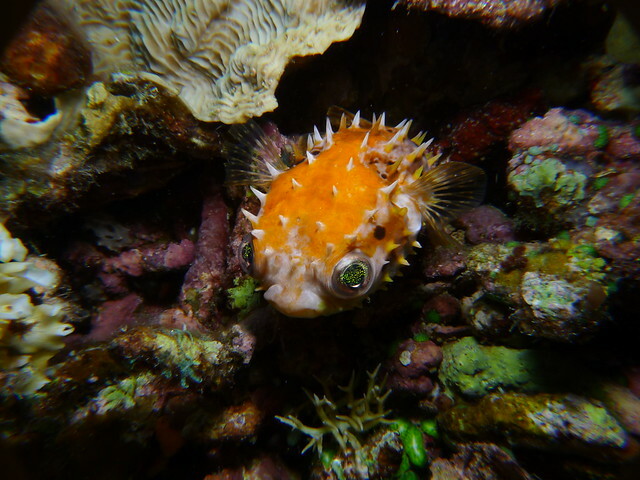 Puffer fish’s eye looks beautiful. It looks like its filled with glow dust. 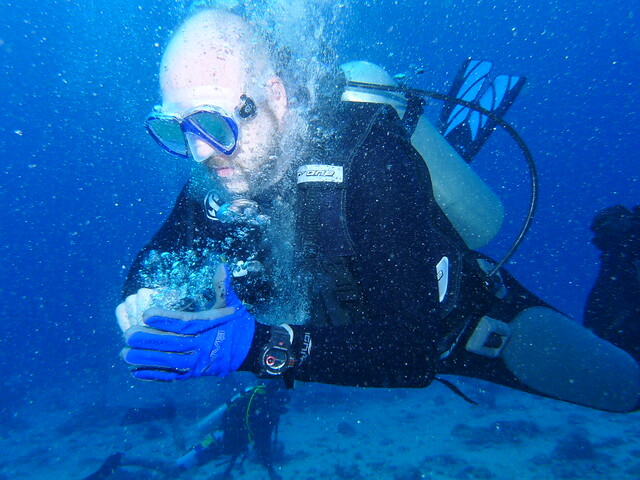 My memorable dive was a UNESCO heritage site in Philippines, The Tubbataha reef. I highly recommend it.